You have complete freedom to choose who performs your data recovery. 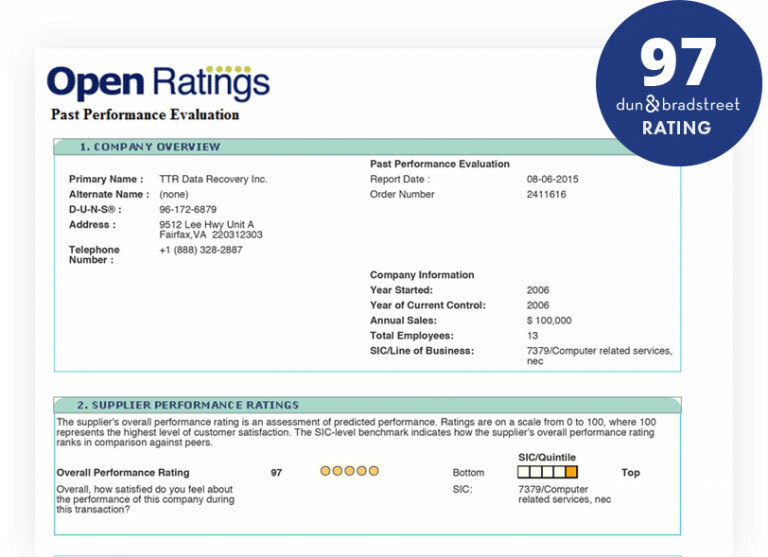 While picking isn't always simple, TTR Data Recovery's 5-star rating and verification from Dun & Bradstreet, or D&B, make it obvious that we're your best option. Why does Our D&B rating matter? The firm’s databases contain around 225 million records, meaning that only the absolute finest earn top rankings. Corporate leaders around the globe rely on D&B ratings for their concentration on business service providers that maintain high levels of accountability while mitigating losses, fraud and similar risks. With an in-industry benchmark score of [INSERT_BENCHMARK_SCORE], TTR Data Recovery dramatically outperforms the vast majority of alternatives in terms of client satisfaction and operational success. What does it mean to us that we’re D&B Verified? It’s more than a mere badge of pride. Maintaining our certification and creditability sets the tone for everything we do. From critical recovery projects to our own internal management policies, we endeavor to preserve an operational culture that grants us the ability to do more for consumers. TTR Data Recovery doesn’t simply offer an unparalleled menu of data recovery services because they’re the industry standard or we know our customers have come to expect them. Instead, we continuously work to expand and refine our offerings in anticipation of technological trends and your business needs. D&B rating or no, we’ll never stop devising new forms of service that improve your overall experience and help you prevent the reoccurrence of future problems. Whether it’s our innovative media pickup, rapid-response recovery, step-by-step progress tracking or specialized NAS and RAID data extrication, you can count on our services to make getting your data back far more enjoyable than the initial loss. Of course, you don’t have to rely on our D&B rating to prove our expertise. Instead, you can discover why consumers constantly give us the highest rankings firsthand. Get in touch with TTR Data Recovery now for your immediate consultation.